I couldn’t resist making another recipe from Claudia Roden’s “The New Book of Middle Eastern Food” to contribute to the Cookbook Guru. AA Milne’s Mary Jane threw a tantrum when rice pudding was served for dinner again and again, however rice pudding is my ultimate comfort food. I blame my Mum and her English style pudding. She made it every week when I was a kid, dessert baked simultaneously with the weekly roast. I loved that sweet milky stodge. I still love rice pudding AND my middle name is Jane. Today Claudia Roden’s Rose Scented Rice Pudding changed my expectations, raised the bar so to speak. It’s sweet, creamy and not at all stodgy. After following the recipe instructions closely, the grains of rice in the reduced milk had made a delicious cream but they’d also maintained their distinct identity. I reduced the recommended volume of sugar significantly. The rose flavour should be elusive, subtle. The rhubarb syrup I served with the rose scented rice pudding was the perfect foil for the sweet pudding and the pistachios a textural contrast. Wash the rice. Put the cold water in a medium saucepan, add the rice, bring to the boil, reduce the heat and simmer for 15 minutes. Add the milk, return the pot to the boil, then reduce the heat to the lowest setting. Put a simmer mat under the pot to discourage the milk from burning. Simmer the rice pudding for approximately 45 minutes stirring very frequently. When the rice pudding is soft and creamy, stir in the sugar and the rose water. Delicious with a tart fruit compute. I’m another that loves rice pudding and this one has really grabbed my interest, though I’ll skip the rhubarb. (Not a fan.) 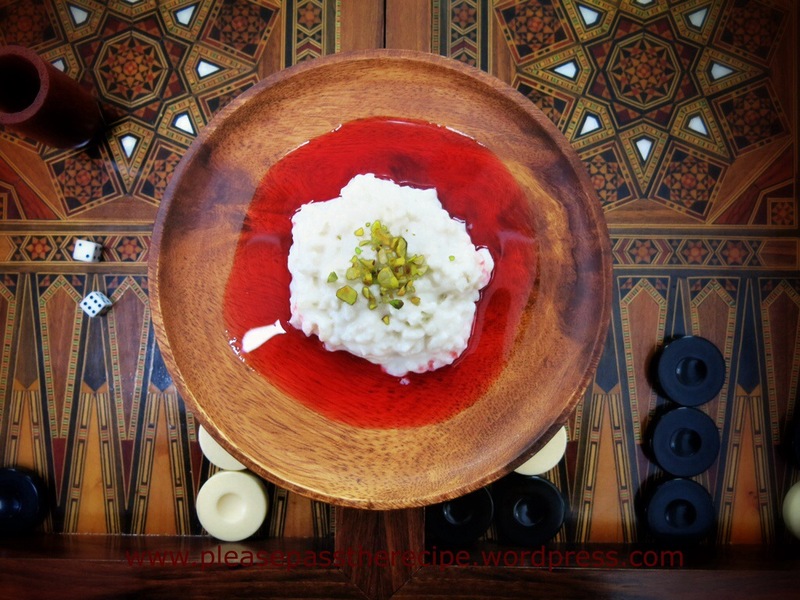 The recipe would have stood on its own but that opening photo, using a backgammon board as place mat, makes your rice pudding all the more visually appealing. This was such a great post. My son loves rice pudding and you have persuaded me to give this a go. Will pick up rosewater when I go out next. That backgammon board is stunning and perfectly exotic as a backdrop to this beautiful dish! I will not tell you what school boy euphemism my husband has for rice pudding! It definitely has a bad reputation, which I am delighted to see you have corrected with this rather delicious looking dessert. I do love a good rice pudding! Comfort food at its best. Sadly Mrs Beaton’s rice pudding days are over in our house now, usurped by Claudia Roden. Another beautiful recipe. I love sweet rice and especially like how you used rhubarb syrup. So creative and original. Well, there are the British Public School type of rice puddings and then there ARE rice puddings like this – have not made one for ages: really should 🙂 ! And the more I hear about this Claudia Roden book the more I feel like breaking my book moratorium and getting it!!!! I have quite a cookbook collection. This is the book I most consistently refer to for advice, ideas and inspiration. Do yourself a favour……..
Beautiful! Some weeks ago I came back home from a middle east market with a bottle of rose water. I’m not so used to use it, but my turkish friend who was with me convinced me to buy in order to try. So thank you a lot for this lovely recipe, now I’m sure that the purchase was worth! I’m going to try to do it. I love rise pudding, and here in Montreal I can find amazing rhubarb in season! I’ll let you know! Forget all the bad things you know and think about rice pudding and enliven your senses with this luscious and fragrant rose scented rice pudding from lady red specs. I can almost smell this dish. And the backdrop is well chosen. This entry was posted on April 13, 2014 by ladyredspecs in Desserts, FODMAP diet, Food, Fruit Desserts, Gluten Free, Light dessert, The Cookbook Guru, Warm Puddings and tagged Claudia Roden, cookbook guru, middle eastern, rice pudding, rosewater.